Martín Alonso Pinzón, (Spanish pronunciation: [maɾˈtin aˈlonso pinˈθon]; Palos de la Frontera, Huelva; c. 1441 – c. 1493) was a Spanish mariner, shipbuilder, navigator and explorer, oldest of the Pinzón brothers. He sailed with Christopher Columbus on his first voyage to the New World in 1492, as captain of the Pinta. His youngest brother Vicente Yáñez Pinzón was captain of the Niña, and the middle brother Francisco Martín Pinzón was maestre (first mate) of the Pinta. The Pinzón family was among the leading families of Palos de la Frontera in the late 15th century. There are several conflicting theories about the origin of the family and of their name (see Pinzón family). His grandfather was a sailor and diver known as Martín; it is not clear whether that was a first or last name, and whether in his generation Pinzón was a surname or an epithet. His father was a sailor named Martín Pinzón; his mother was named Mayor Vicente. Born in Palos around 1441, it appears that at quite a young age Pinzón shipped out on a locally based caravel as a grumete (cabin boy). His home, now the Casa Museo de Martín Alonso Pinzón, was on the old royal road to the Monastery of La Rábida. Martín's family contracted a marriage with a resident of the locality named María Álvarez. They had five children: two boys—Arias Pérez and Juan, who participated in several expeditions to the Americas—and three girls—Mayor, Catalina, and Leonor. Leonor, the youngest, suffered frequent attacks of what was then called "gota coral" and would now be called epilepsy. A French tradition holds that Alonso Pinzón sailed to the New World with the navigator Jean Cousin, and that together they discovered the continent in 1488, four years before Colombus. Back in Dieppe, Pinzón left Cousin in a dispute, and is claimed to have left for Spain, from where he advised Columbus on his westward sail. Pinzon is known to have displayed a remarkable confidence in guiding Columbus in his discovery of the New World. No indisputable written records remain, however, to support this early claim to discovery. His nautical experience and his leadership remained patent in the 1508–1536 lawsuits known as the pleitos colombinos ("Columbian lawsuits"), where the witnesses indicated him as the leader of the comarca (a region comparable to a shire). He was also famous for his battles against the Portuguese in the War of the Castilian Succession. It is probable that even while in Portugal before coming to Spain, Columbus was aware of Martín Alonso, because he was known for his participation in the war, as well as for his incursions into the Afro-Atlantic waters in the wake of the Portuguese, traveling to the Canary Islands and Guinea, with their rich fisheries and the commercial possibility of trade in gold, spices, and slaves. On 23 May 1492 a royal provision was read out to the residents of Palos, by which the Catholic Monarchs Isabella and Ferdinand ordered that certain residents deliver two caravels to Columbus and travel with him on his voyage that he was making "by command of Their Highnesses" ("por mandado de Sus Altezas") and that the town should respect the royal decision. The locals did not comply. The sailors of Palos had no confidence in embarking on this adventure with Columbus, who was largely unknown to them. Independent of their greater or lesser credence in his ideas, the men of Palos found it difficult to support the Genovese sailor if he was not accompanied by a mariner known and respected in the town. The venture—risky and, above all, of uncertain profit—did not present great attractions. Opposition or indifference to Columbus's project was general. At about this time, Pinzón returned from a routine commercial voyage to Rome. The Franciscans of the Monastery of La Rábida put Columbus in touch with Pinzón. Pinzón's friend Pero Vázquez de la Frontera, a very respected old mariner in the town, also had an important influence on Pinzón deciding to support the undertaking, not only morally but also economically. There is no record of any written agreement between Columbus and Pinzón, and the terms of any agreement are lost to history. However, we do have the writings of Fray Bartolomé de las Casas and the testimony of some witnesses. According to Fernández Duro, de las Casas says Columbus offered Pinzón equal honors in the voyage and half the profits, and Diego Pinzón Colmenero testified the same in the pleitos colombinos; Francisco Medel testified that he heard him offer Pinzón "whatever he asked for and desired". As a strong sign of his commitment to Columbus's plan, Pinzón put up half a million ("medio cuento") maravedís in coin toward the cost of the voyage, half of the amount that had been put up by the monarchy. Thanks to his prestige as a shipowner and expert sailor and his fame throughout the Tinto-Odiel region, he was able to enlist an appropriate crew. Signing on, he dismissed the vessels that Columbus had already seized based on the royal order and also dismissed the men he had enrolled, supplying the enterprise with two caravels of his own, the Pinta and the Niña, which he knew from his own experience would be better and more suitable boats. Furthermore, he traveled through Palos, Moguer and Huelva, convincing his relatives and friends to enlist, composing of them the best crew possible. According to testimony in the pleitos colombinos, he "brought such diligence to secure and animate the people as if what were discovered were for him and his sons." Among those he recruited were Cristóbal Quintero from Palos and the Niño brothers from Moguer. At this time, Pinzón and Columbus seemed quite close. In the pleitos colombinos, witness Alonso Gallego from Huelva remembered hearing Columbus say, "Mister Martín Alonso Pinzón, we are going on this voyage which, if we go on with it and God reveals new lands to us, I promise by the Royal Crown to treat you as a brother." Replica of the caravel Pinta at the Wharf of the Caravels in Palos. Statue of the Pinzón brothers in Palos. On 3 August 1492, the Santa María, Pinta, and Niña left Palos on their voyage of discovery. Admiral Columbus captained the flagship Santa María, Pinzón was captain of the Pinta; his middle brother Francisco was master. It was from the Pinta that Rodrigo de Triana would be the first to sight land in the Americas. ...was a bit less worried knowing that Martín Alonso Pinzón was a vigorous and ingenious person. ...he resolved the problem of the broken tiller of the Pinta and was able to continue sailing. At that time, Pinzón suggested to Columbus the change of course on 6 October 1492 This change brought the expedition to landfall on Guanahani on 12 October 1492. These and other acts by Pinzón and by his brothers, especially Vicente, have led historians to see the brothers as "co-discoverers of America", in that without their help, support, and courage, Columbus probably could not have achieved his enterprise of discovery, at least not in that time and place. At one point during the pleitos colombinos, a royal prosecutor argued that Pinzón had played a more important role in the discovery of the Indies the Columbus himself. All evidence—the remarks in Columbus's diary, the testimony in the pleitos colombinos—is that on the outward voyage, relations between Columbus and Pinzón remained positive. Once among the Caribbean islands, that began to change. On 21 November 1492, off the coast of Cuba, Pinzón failed to follow a direct order of Columbus to change course. He probably sailed off on his own trying to make individual discoveries and to find treasure, although Cesáreo Fernández Duro argues that the initial separation may have been accidental, a matter of missed signals. (Asensio takes Fernández Duro strongly to task for not adequately explaining the length of the separation; Fernández Duro responds that Pinzón simply continued the prior course, and if Columbus wanted, he should have had a pretty fair idea where to find him over the next several days.) During his separate travels he discovered new land; while all of the island geography of the first voyage is open to question, it is believed that the land was Haiti. 19th-century historian José María Asensio, at least, blamed Pinzón's absence for the fact that on 25 December, the Santa María was wrecked on a shoal; Pinzón's brother Vicente in command of the Niña played a key part in rescuing the sailors and Columbus himself. Columbus, giving up on Pinzón, began sailing homeward 4 January, leaving behind 38 men, all of whom died before Columbus's return nine months later. The Niña and Pinta sighted and rejoined one another 6 January 1493, and, after a furious argument in which according to at least one witness, Pinzón objected to the 38 men being "left so far from Spain, being so few, because they could not be provided for and would be lost", and Columbus threatened to hang Pinzón, the two ships headed together back toward Spain on 8 January. Nonetheless, much of the testimony in the pleitos colombinos, as well as part of the specialized historiography and investigators, does not agree that these things happened in this manner, nor is there any accusation against Pinzón in Columbus's Letter on the First Voyage, which Columbus wrote during his return. During the voyage back to Spain, Pinzón's ship was separated from Columbus in stormy conditions, southwest of the Azores. Pinzón arrived in Baiona in Galicia, near Vigo, 1 March 1493; Columbus reached Lisbon on March 4; he later faced problems with the Court for having touched down in Portugal out of necessity in bad weather. Pinzón, despite the bad weather and strong southerly winds, had managed to touch down on Spanish territory, not Portuguese. Believing Columbus to be lost, he sent a letter to the King and Queen; some have argued that he claimed the glory of the great discoveries for himself, while others defend him from the charge; the letter itself is lost. It is not clear whether his letter or Columbus's from Lisbon reached court first, nor is it clear whether the failure to invite Pinzón to court resulted from Columbus's primacy of position, possible accusations by Columbus against Pinzón, or simply reports of Pinzón's illness and death. Pinzón returned home to Palos, arriving on 15 March 1493, precisely the same day the Niña reached the voyage's starting point. Exhausted and suffering from a recurrent fever, he was taken from his ship in a stretcher. As Columbus arrived, his friends took him to a farm on the boundary between Palos and Moguer. 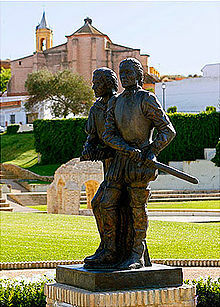 It is possible that Martín's son, Arias Pérez Pinzón, did not bring him directly to his house in Palos in order to protect him, given that Columbus had threatened him earlier. Another possibility is that this was because Martín did not get along well with Catalina Alonso, the woman who had been living with his father since he became a widower, and with whom the father would have two illegitimate children: Francisco and Inés Pinzón. According to the testimony of Francisco Medel and Hernán Pérez Mateos, he was brought to the La Rábida Monastery, where he died; he was entombed there, as was his wish. It has been claimed that Pinzón's recurring fever was syphilis. The theory that syphilis is of New World origin and that it was first brought back to Europe by Columbus's crew has been longstanding, and long controversial. Some recent genetic evidence restores credence to the theory. Even so, even if Pinzón contracted it on the voyage, it is extremely unlikely that it was the cause of his death. Tertiary syphilis does not normally show up for 3 to 15 years. There is also a possibility that some historians have confused Martín Alonso Pinzón with his brother Francisco, who is more plausibly (but still controversially) believed to have had this particular disease. Conversely, there is the possibility that the first outbreak of syphilis among Europeans with no immunity was much more virulent than subsequently. Fernández Duro further writes that Pinzón's "unpardonable crime" was that he had the luck or skill to obtain more gold than Columbus. Martín Alonso Pínzon was portrayed by Tchéky Karyo in 1492: Conquest of Paradise and Robert Davi in Christopher Columbus: The Discovery, both released in 1992. ^ a b c Kennedy, Thomas (1913).Martín Alonso Pinzón. In The Catholic Encyclopedia. New York: Robert Appleton Company. Retrieved 2009-05-15 from New Advent. ^ a b Thomas Kennedy in his 1913 article Martín Alonso Pinzón in The Catholic Encyclopedia says he died "a few months" after his 15 March 1493 return to Palos. ^ a b c Izquierdo Labrado, Julio (1985). "Martín Alonso Pinzón". Archived from the original on 2004-08-03. Retrieved 2008-10-18. ^ a b Archivo General de Simancas, Registro General del Sello, March 1505. ^ Herbermann, Charles, ed. (1913). "Martín Alonso Pinzón" . Catholic Encyclopedia. New York: Robert Appleton Company. ^ Izquierdo Labrado, Julio (2003). "Breve historia de Palos de la Frontera". Archived from the original on 2007-12-27. Retrieved 2008-10-03. ^ Instituto Andaluz del Patrimonio Histórico, Junta de Andalucía. "Casa de Martín Alonso Pinzón". Retrieved 2008-10-26.
www.elpais.com. "Descubrir el hogar de Pinzón". El País. Retrieved 2009-05-05. ^ Relevant passages from the pleitos colombinos are cited in Ortega 1980, Tomo III, p. 47 and quoted in the notes for the article Pinzón brothers. One witness said of him "neither on sea nor land the King had no other man so valiant nor brave as him". ^ Ibarra y Rodríguez, Eduardo (1892). Don Fernando el Católico y el descubrimiento de América. Imprenta de Fortaner, Madrid. pp. 180–184. The link is to archive.org. ^ Vila Vilar, E. (1991). "Pinzón, Hermanos". Ediciones Rialp S.A. Gran Enciclopedia Rialp. Archived from the original on 2009-04-03. Retrieved 2010-01-15. ^ Fernández Duro, Cesáreo (1892-01-22). "Pinzón, en el descubrimiento de las Índias" (PDF) (Año XXXVI. Núm. III.). Madrid: La ilustración española y americana. : 46–47. Retrieved 2009-06-04. Online on Biblioteca Virtual Miguel de Cervantes. ^ a b de las Casas, Bartolomé. "Tomo I. Capítulo XXXIV, pág. 256". Historia de las Indias. Retrieved 2008-10-18. On the website of the Biblioteca Virtual Miguel de Cervantes. ^ a b Asensio 1892, p. 66–68. "Historia de la navegación: Martín Alonso Pinzón". www.mgar.net. Retrieved 2009-08-28. Izquierdo Labrado, Julio. "Martín Alonso Pinzón". es.geocites.com. Archived from the original on 2009-07-27. Retrieved 2009-08-28. ^ a b Diputación de Huelva. "Los marineros de Huelva". Archived from the original on 2009-08-10. Retrieved 2008-10-18. ^ a b Ibarra y Rodríguez, Eduardo (1892). "Cap. VIII". Don Fernando el Católico y el descubrimiento de América. Madrid: Imprenta de Fortaner. p. 184. ^ Menéndez-Pidal, Gonzalo. "Tres puntos finales, Cristóbal Colón". Hacia una nueva imagen del mundo. Centro de Estudios Políticos y Constitucionales, 2003. ISBN 978-84-259-1245-0. ^ Gould 1984. The actual ownership of the Niña is in some question; quite possibly Pinzón had a lease on it, rather than outright ownership. ^ Fernández Duro, Cesáreo (1892-01-22). "Pinzón, en el descubrimiento de las Índias" (PDF) (Año XXXVI. Núm. III.). Madrid: La Ilustración Española y Americana. : 46–47. Retrieved 2009-06-04. ... traía tanta diligencia en allegar la gente é animalia, como si para él y para sus hijos hobiera de ser lo que se descubriese. Online on Biblioteca Virtual Miguel de Cervantes. ^ Señor Martín Alonso Pinçón, vamos an este viage que, si salimos con él y Dios nos descubre tierras, yo os prometo por la Corona Real de partir con vos como un hermano. Pleitos colombinos. Testimonio de Alonso Gallego en las probanzas de 1515, en Palos. Archivo General de Indias. Sección: Patronato. Signatura: PATRONATO,12,N.2,R.23. Ortega, Ángel (1980) . La Rábida. Historia documental crítica. 4 vol. (facsimile edition). Tomo III. Diputación Provincial de Huelva. Servicio de Publicaciones. p. 53. ISBN 978-84-500-3860-6. ^ See also Fernández Duro 1892, p. 50-51 for another quotation of similar import, this from Columbus's son and heir Diego Colón. ^ Diario de a bordo del primer viaje de Cristóbal Colón: texto completo (complete text of the Ship's diary of Columbus's first voyage, as assembled by Fray Bartolomé de las Casas. Hereafter, "Ship's Diary") 11 October  "And because the caravela Pinta had more sail and went ahead of the Admiral, it found land and made the sign the Admiral had ordered. This land was seen first by a sailor named Rodrigo de Triana." "Y porque la carabela Pinta era más velera e iba delante del Almirante, halló tierra e hizo las señas que el Almirante había mandado. Esta tierra fue vista primero por un marinero que se decía Rodrigo de Triana"
^ Testimony in the pleitos colombinos by Hernán Pérez Mateos, former pilot of Palos, age 80, given in Santo Domingo 26 January 1536. Archivo General de Indias. Sección: Patronato. Signatura: PATRONATO,12,N.2,R.14. —  Diario de la primera navegación. Narrative assembled by Bartolomé de las Casas. ^ Fernández Duro 1892, p. 45-47. ^ Villapolos Salas, Gustavo (1976–1977). "La naturaleza procesal de los Pleitos Colombinos" (PDF). Anuario Jurídico. Biblioteca Jurídica Virtual. III-IV: 300 (p. 16 of PDF). Archived from the original (PDF) on 2011-07-28. Retrieved 2009-08-14. ^ José María Asensio quoted in Fernández Duro 1892, p. 67 et. seq. ^ José María Asensio quoted in Fernández Duro 1892, p. 73 et. seq. In this passage, Fernández Duro is quoting Asenio quoting Fernández Duro himself. ^ McElroy, John W. (1941) The Ocean Navigation of Columbus on His First Voyage. The American Neptune, I 209-240. ^ Peck, Douglas T. (1993) Christoforo Colombo, God's Navigator, Columbus, WI: Columbian Publishers. ^ Marden, Luis. (1986) The First Landfall of Columbus. National Geographic, 170 (November) 572-577. ^ Goldsmith, Roger A. and Philip L. Richardson, (1992). Numerical Simulations of Columbus' Atlantic Crossings. Woods Hole Oceanog. Inst. Tech. Rept., WHOI-92-14, February 1992. ^ Ship's Diary, 25 December . ^ Ship's Diary, 2 January , 4 January . ^ a b c d Edward T. Stone, Columbus' La Navidad: The Fate of the New World’s First Spanish Settlement Archived 2009-06-02 at the Wayback Machine, American Heritage, April/May 1978, Volume 29, Issue 3. Accessed online 2010-01-15. ^ Ship's Diary, 9 January . ^ Christopher Columbus (1451-1506), Textbook Site for The Heath Anthology of American Literature, Fifth Edition, Paul Lauter, General Editor, college.cengage.com, accessed online 2010-01-14. ^ The matter is taken up at length in Estelle Irizarry, "The two authors of Columbus' Diary, Computers and the Humanities, Springer Netherlands, ISSN 0010-4817 (Print), Volume 27, Number 2 / March, 1993 ISSN 1572-8412 (Online), DOI 10.1007/BF01830301. The free online SpringerLink page gives an abstract and a free excerpt, but there is no free online access to the paper itself. ^ Fernández Duro 1892, p. 66-108. ^ Manuel López Flores (1964). Colón no descubrió América. Madrid: Editorial Clásica. pp. 253–262. DL: M. 7.245-1964. ^ Las naves Archived 2009-08-10 at the Wayback Machine, on the site of the Wharf of the Caravels, Diputación Provincial de Huelva. Accessed online 2010-01-15. ^ Fernández Duro 1892, p. 113. ^ Fernández Duro 1892, p. 117 et. seq. ^ Archivo General de Simancas, Registro General del Sello, 12 de octubre de 1493. ^ Martín Alonso Pinzón, Festa de Arribada, Ayuntamiento de Baiona. Accessed online 2010-01-12. ^ See for example Lisa M. Benton and John Rennie Short, Environmental discourse and practice, Wiley-Blackwell, 1999, ISBN 0-631-21114-4, p. 40. Accessed online at Google Books. ^ a b Andrew F. Downing, "Were the Sailors of Columbus the First European Syphilitics? ", The Boston Medical and Surgical Journal, October 12, 1916, 515:522. Available online through Google Books. ^ a b W.A. Pusey, "The Beginning of Syphilis", Journal of the American Medical Association, Volume LXIV, number 24, June 12, 1915, 1961:1964. Available online through Google Books. ^ Julie Steenhuysen, New study blames Columbus for syphilis spread, Reuters, 2008-01-15. Accessed online 2010-01-15. ^ Syphilis - tertiary, Medline Plus (U.S. National Library of Medicine, National Institutes of Health). Accessed online 2010-01-24. ^ Fernández Duro 1892, p. 93 "Pero en esa isla, Pinzón tuvo suerte ó maña para obtener más oro que el Almirante. Eso era la soberbia, ese la codicia, eso el crimen imperdonable del capitán de la Pinta a los ojos de Colón, y no podía ingenuentamente declararla." Asensio, José María (1892), Martín Alonso Pinzón: estudio histórico, La España Moderna Online at archive.org. Gould, Alice B. (1984), Nueva lista documentada de los tripulantes de Colón en 1492 (in Spanish), Real Academia de la Historia., ISBN 978-84-600-3829-0 The link is to an abridged copy on Google Books. (in Spanish) Adám Szászdi: El descubrimiento de Puerto Rico en 1492 por Martín Alonso Pinzón, in: Revista de historia. San Juan, Año 1(1985), Nr. 2, S. 9-45. (in Spanish) Domingo Gómez: Vindicación del piloto de la carabela "Pinta", Martín Alonso Pinzón, in: Mundi hispánico. - Madrid, Año 21(1968), Nr. 241. (in Spanish) Francisco Morales Padrón: Las relaciones entre Colón y Martín Alonso Pinzón, in: Actas. - Lisboa, Vol. 3(1961), S. 433-442. (in German) Urs Bitterli: Die "Wilden" und die "Zivilisierten", 3. Aufl., München 2004 ISBN ? (in German) Ders. : Alte Welt - neue Welt, München 1992 ISBN ? (in German) Ders. : Die Entdeckung Amerikas, 4. Aufl., München 1992 ISBN ? This page was last edited on 24 March 2019, at 21:56 (UTC).